Since 1996, the Greater Philadelphia Coalition Against Hunger has fought food insecurity in Southeastern Pennsylvania through education, outreach, and advocacy. From running workshops to conducting food stamp outreach to organizing its annual Walk Against Hunger, the Coalition links people and organizations concerned about the growing problem of local hunger and food insecurity. In 2006, 145,000 Philadelphians were food insecure including 61,000 children. In 1997, the Coalition began holding its First Tuesday monthly roundtable discussions. These meetings are mainly for community-based food providers but are open to anyone who would like to attend. Each meeting focuses on a different topic affecting food providers. This year’s calendar includes topics such as: Resources to Hel Your Clients Be More Self Sufficient, Resources for Grandparents Raising Grandchildren, and Food Safety & How to Prepare a “Safe” Thanksgiving Turkey. Because strong networks allow everyone to better serve their clientele, these meetings also encourage networking among the food providers. The meetings are held from 12:00pm to 1:15pm on the first Tuesday of each month at the Nutritional Development Services building, 111 S. 38th St. For more information please contact Katie Kerr or Tanya Sen. In September of 2002, the Coalition was one of 19 agencies funded through a grant from the United States Department of Agriculture to embark on a Food Stamp Enrollment Campaign. Since then, the Coalition has assisted over 27,000 households gain access to food stamps. Each month roughly 200 applications are submitted online through COMPASS, Pennsylvania’s online application for benefits. A future walker shows her support. The Coalition uses a variety of approaches to provide food stamp outreach. The first is its Food Stamp Screening & Application Assistance Hotline. 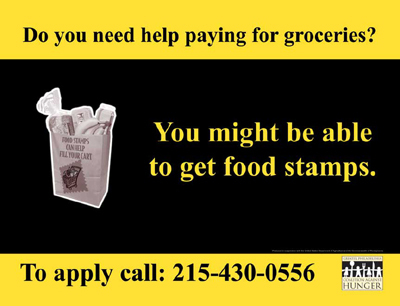 If someone would like to see if he is eligible for food stamps or needs help filling out an application, he can call the Coalition’s Food Stamp Hotline: 215-430-0556. The Hotline runs Monday through Friday from 9:00am to 5:00pm but messages left after hours are always returned. Anyone can find out if they are eligible to receive food stamps and can get help filling out the application. Most recently, the Coalition has gotten access to Language Line services so that those who do not speak English can also gain access to food stamps. The other outreach approach uses student and faith-based (should I just say other instead of faith based?) volunteers who act as food stamp advocates. These advocates are stationed at health centers and Pennsylvania Career Links Offices throughout Philadelphia where they perform outreach and help clients fill out food stamp applications on site. If you are interested in becoming a screener at one of these sites please contact Julie Eubank or Anna Kastner. On October 16th the Coalition Against Hunger hosted the “2008 Food Stamp Forum: Bigger Benefits, Expanded Eligibility.” The forum highlighted improvements to the food stamp program that took effect October 1st. Some of those changes include the removal of the asset test, removal of the cap on child and dependent care costs, and an increase in the gross income guidelines for eligibility. For more information on these changes please contact the Coalition. 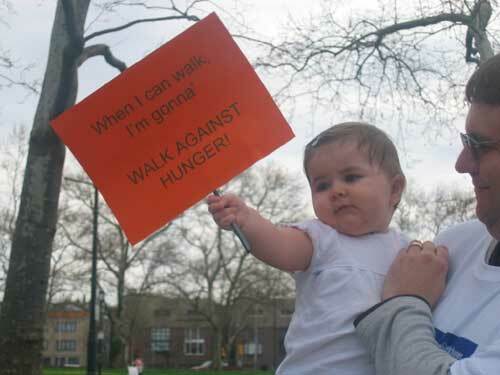 On the 2nd Saturday in April each year the Coalition hosts its Walk Against Hunger. The Walk begins at Eakins Oval, across from the Philadelphia Museum of Art, and follows a route North up the Strawberry Mansion Bridge and then turns around and comes back the same way. People can either walk as individuals or as part of a team. Last year, at the 12th annual walk, 3,700 walkers came out to show their support! Money raised by walkers benefits food cupboards and soup kitchens in Southeastern Pennsylvania and Southern New Jersey. This year’s walk will take place on April 11th. While the walk is in April it’s never too early to start fundraising! For more information visit the Walk’s website. For more information on the Coalition and all of its programs or to see how you can help please visit our website, email us, or call us at 215-430-0555.